This 48ft Ocean Yacht out of Playa Hermosa and Playas del Coco is powered by twin 600HP Cummins diesels. Bilingual Captain Diego, who has fished the area since 2005, first as a mate and then as captain, is at the helm, assisted by two mates. 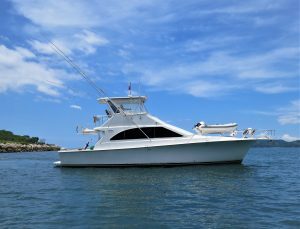 The boat has an A/C salon, two A/C staterooms, flybridge, a complete range of conventional Penn International light and heavy tournament-class equipment, full electronics including VHF radio and fishfinder, and the required USCG-approved safety gear. Maximum 10 anglers. Where possible, it can pick up at local area beaches.